Carbon quantum dots, a new class of carbon nanomaterials, have attracted increasing attention in photocatalytic field, due to their excellent physical and photochemical properties. In this work, carbon quantum dots with abundant of surface hydroxyl/aldehyde groups reduce silver ion and partial vanadate to induce the formation of carbon quantum dots (CQDs) @ Ag/VOx nanorods in a mild hydrothermal condition. 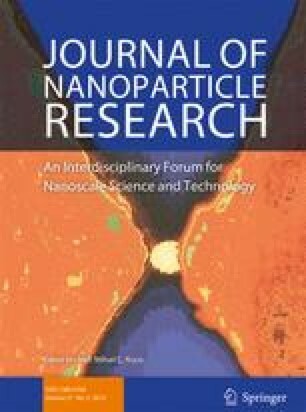 HRTEM graphs show that VOx nanorods are composed of VOx particles, and CQDs @ Ag cover the surface of nanorods or intercalates in the small voids between VOx particles. After further reduction of some residual Ag+ and oxygen-containing groups on CQDs surface by NaBH4, RCQDs @ Ag/VOx nanorods display a high photocatalytic activity on degrading the organic dyes under visible light, attributed to their unique one-dimensional structure and the synergistic effect of RCQDs and Ag nanoparticles on improving the light absorbance and hindering the recombination of electrons and holes. The online version of this article ( https://doi.org/10.1007/s11051-019-4477-6) contains supplementary material, which is available to authorized users. This work was supported by the National Natural Science Foundation of China (no. 51302072, 51872081).